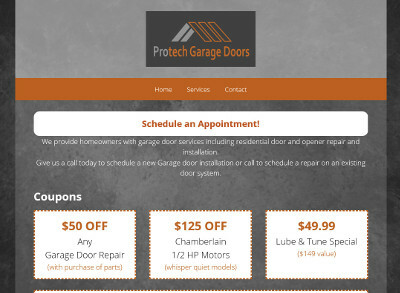 Jeremy, the owner of ProTech Garage Doors in Austin TX, asked us to help get a simple website created and a professional print-grade logo. Jeremy placed his order and immediately followed up with some of the website information. He also completed the logo questionnaire and sent in several examples of logos that he liked. Today, the final touches were put on the site with the completion of adding the logo and making some minor color adjustments. The ProTech Garage Doors website is at protechgd.com.